The more you stay the more you earn. 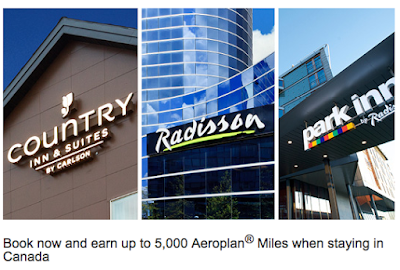 The 5,000 Offer ("Promotion") is available on new reservations at participating Radisson, Country Inns & Suites By Carlson and Park Inn by Radisson hotels in Canada (“Participating Properties”) for Eligible Stays with a check-in date beginning March 15, 2016 and completed by May 31, 2016 ("Promotional Period"). An Eligible Stay is defined as a stay at an eligible rate of one or more nights at the same hotel regardless of the number of times you check-in or check-out during the stay. Ineligible rates under the Promotion include employee rates; airline crew rates; travel agent rates; hotel employee rates; tour operator rates; wholesaler rates; rates booked through online travel companies; complimentary rooms, including, but not limited to, rooms booked as Award Night stays, or other stays involving other gift certificate or free night vouchers. Members who provide their account number at the time of check-in can earn up to a maximum total of 5,000 miles for up to three Eligible Stay during the Promotional Period. Bonus miles are calculated on the standard per stay mileage award per hotel brand. Radisson standard mile award is 500 miles, Country Inn & Suites and Park Inn by Radisson standard mile award is 250 miles. Maximum number of bonus miles awarded during the Promotional Period per Aeroplan Member is 5,000 bonus miles. Guests will earn double miles with the first stay, triple miles with the second stay and five times the miles with the third stay. Participating Properties are subject to change without notice. Gold Points® may not be earned for Eligible Stays under this Promotion. To the maximum extent permitted by law, Carlson Hotels, Inc. reserves the right to add, modify or discontinue these terms and conditions or the Promotion with or without notice. Void where prohibited by law. By participating in this Promotion, you agree and consent to these terms and conditions. Mileage is subject to all Aeroplan program rules and regulations.